The training equipment was given to national football team training squad member, Aleck Wickham, who is based on Obobulu village last week. This handout came from excess equipment supply which was left over from the initial phase of Just Play. Wickham approached Ohoto’ona last week with his request to try out Just Play in Obobulu village. He explained that prior to coming to Honiara to play for Western United in the Telekom S-League he ran a football training program for kids there and the potential for further development is great. Wickham says that since he needs time to recover from the injury that forced him out from the national team it is best he use it to train potential stars for the future. “I approached SIFF because I have some free time on my hand and the opportunity to work with kids from Obobulu and I am thankful for the positive response that I have received,” Wickham says. After considering his request Ohoto’ona decided to issue the equipment to Wickham saying that community initiatives like this need to be supported. “Just Play is a grassroots development tool and when there is initiative coming from the communities I feel it is right for us to assist them. 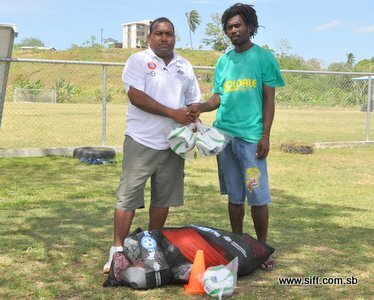 This case is special because Wickham is a national player and he can give that extra quality which none of us can,” Ohoto’ona says adding that he is fully confident of the success of the program under the leadership of Wickham. Wickham missed out on representing Solomon Islands at the Pacific Games after he was ruled out with a groin injury. It is estimated that it will take up to 2 months for Wickham to recover and it is this time that he is allocating for running the Just Play program at Obobulu. The pack that was issued to Wickham contained 10 balls, bibs, cones and speed rings plus the Just Play training manual. With this equipment he will have the capacity run a much more effective training program that can cater for up to 30 children.